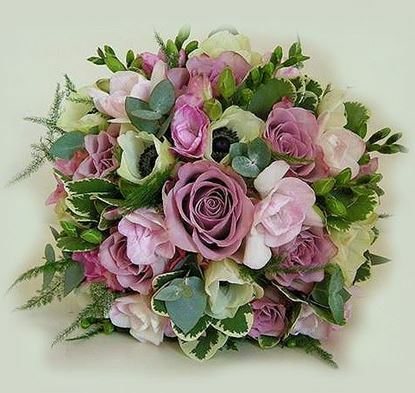 This sophisticated wedding bouquet is perfect mixture of strong and soft colours of blooms. A blend of lilac-purple-cream flowers. It includes white cream and lila coloured roses, deap purple eustoma, scented freesia, white veronica and more. Truly elegant, and styled to create that perfect wedding look. Bouquet is Approx. 30*30cm in diameter.